Review of The Cooking of Vienna’s Empire, with a recipe for Cold Sour Cherry Soup. This is a fascinating book given current affairs. “Vienna’s Empire” covers Czechoslovakia, Austria, Hungary, Romania, and Yugoslavia. It includes Transylvanian recipes! Most of the book is not recipes, but talking about food. It was written in 1968, when the politics of the region were much different than they are today. Czechoslovakia had lost much of its old culinary eminence in recent years, but at Montreal’s Expo 67, the Czechs demonstrated beautifully that the talent is still there (despite man- or state-made obstacles). Hopefully the situation inside the country may improve before long. Both the first three and the final chapters cover Austria, old Austria, new Austria, the provinces, and then pastries in Vienna. All of the “old” recipes are sweets, including an amazing-looking concoction of fat, cream, eggs, and flour called “Faschingskrapfen”, which sounds like a Volkswagen joke but are “carnival jelly doughnuts”. The recipe calls for apricot jam, but any jam will suffice. The dough is flavored with rum, orange juice, and vanilla. A bit of work involved, and they must be eaten immediately, but are marvelous! New Austria is more varied: Viennese steaks, zucchini with dill sauce, anchovy butter sauce, cucumbers stuffed with ham and sour pickles, boiled lamb in marjoram sauce, sour pickle and vinegar potatoes, melons stuffed with cherries and whipped cream, and many more. There is a lot of meat in these recipes, and throughout the book. The provinces include Salzburg, the areas around the Danube in Lower Austria, Burgenland, the “Garden of Vienna”, and the Tyrolean Alps, a range of areas that will serve game, smoked meats, fish, a few good wines, and good beer. High points in these recipes are bacon dumplings, pan-fried venison cutlets with cream sauce, roast chicken stuffed with shrimp, beefsteak and onions with caraway seeds. There is a lot of talk but few recipes here. Hungary is the land of paprika. The center photo in this section is a two-page spread of paprikas hanging and laying out to dry. The “Paprikás Burgonya”, or “Potato Paprika Stew” is wonderful, especially if you can find some Hungarian sausage or close to it. (I use linguica from a local German sausage shop.) The cold cherry soup recipe below is a Hungarian recipe. Transylvanian layered cabbage, Transylvanian goulash, both heavy in paprika, make one think of dark foreboding castles and nobles with large teeth. There is also braised pork chops in dill-and-paprika sauce, pork-stuffed cabbage rolls, and a couple of kohlrabi recipes. The author spent his youth in Czechoslovakia, and remembers well the food of his youth, disdaining the food, beer halls, and times of Czechoslovakia’s present, the late sixties under Soviet control when this book was researched and written. He tells the fascinating story of his family’s cook and the food she made. Czech recipes include braised cabbage with bacon, carp in black sauce, roast goose with sauerkraut, green beans, paprika, and yeast fruit dumplings. The dumplings take some work but your guests will marvel. Yugoslavia and its five nationalities—Serb, Slovene, Croatian, Montenegrin, and Macedonian—live in six republics, which you have probably heard of on the news: Croatia, Slovenia, Bosnia and Herzegovina, Montenegro, Macedonia, and Serbia. Good story about smashing glasses on walls. “There is always a reason for celebrating something.” Pork and bean casserole looks awfully familiar if you like pork and beans. Less paprika than you would find in a Hungarian recipe. Some skewer recipes, which are of course quite simple if you can find a charcoal grill. Chicken and sauerkraut, fish dalmation style. Serbian vegetable caviar, which is a peppery variation on baba ganouj. Plum preserves and watermelon preserves round out the Czech recipes. The final section covers Viennese desserts. “The Pastry Paradise”. The centerpiece (and the cover picture) is “the fanciest cake in Vienna”, the Spanische Windtorte, a cake made relatively simply with meringue sides, filled with whipped cream and fresh berries. 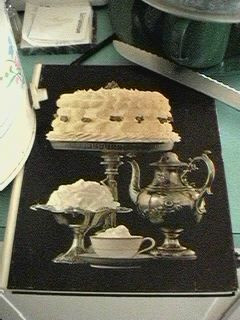 The difficult part will be making the meringue (I can never make meringue correctly without a kitchen-aid) and, if you are not artistically inclined, decorating the cake. If you just want to slap it together it will not look nearly as impressive, but it should taste the same. When new, the book apparently also came with a handy recipe book that includes all of the recipes in the book but is designed for kitchen use—a “wipe-clean” cover and a spiral binding. My extremely cheap, used copy did not include this book, however. I have since seen other books in this line, and the kitchen-book is never included at used bookstores, even when it is available. I later picked up the spiral-bound companion for $1.00. It includes a few recipes not available in the main book: Cottage cheese dumplings, Hungarian white bread, Beef roulades, Mushroom sauce, and cottage cheese pancakes. The most interesting is probably the “Topfenknödel”, the cottage-cheese dumplings, very buttery, boiled then fried, and served with jam. The author quotes an “old proverb” that I’ve never heard: “every country gets the cuisine it deserves”. This scares me. What cuisine does America deserve? McDonald’s? This is a good book with many recipes for an active lifestyle. By “active lifestyle” I mean hard, sweating, strong work. There is very little in here that is fat free or low in calories. Lots of meat, cream, and eggs, and if not butter than lard or drippings. What I’ve had a chance to try has been quite good, but I must ration these recipes or they will be less enjoyable (and I will break my bicycle). ¾ cup chilled dry red wine. Combine water, sugar, cinnamon in 2-quart saucepan. Partially cover, simmer for 35 to 40 minutes (fresh cherries) or 10 minutes (canned). Mix arrowroot and 2 tblsp cold water to paste. Stirring constantly, bring soup almost to boil. Reduce heat, simmer 2 minutes (until clear and slightly thickened). Pour into shallow glass or stainless-steel bowl. Before serving in pre-chilled bowls, stir in cream and wine. If you enjoy cookbooks, you might also be interested in A Concise Encyclopedia of Gastronomy, Bull Cook Historical Recipes, Cavalier Cooking, Classic Chinese Cuisine, Cooking the Bahamian Way, Country Commune Cooking, Life, Loves, and Meat Loaf, The Art of Korean Cooking, The Casserole Cookbook, The Complete Book of Oriental Cooking, The Complete Bread Cookbook, The Frugal Gourmet Celebrates Christmas, The Healthy Cuisine of India, The New Larousse Gastronomique, Saucepans and the Single Girl, The Northwest Cartoon Cookery, Good Food From Mexico, Laurel’s Kitchen, James Beard’s Fireside Cook Book, French Bistro Cooking, A Fifteenth Century Cookry Boke, Crockery Cookery, Southern Cooking, The Frugal Gourmet Keeps the Feast, The Fannie Farmer Cookbook, French Cooking Simplified With a Food Processor, In Good Taste, Heritage of America Cookbook, Our Favorite Hometown Recipes Vol. II, The Indian Spice Kitchen, Japanese Country Cookbook, La Cuisine Française, Larousse Treasury of Country Cooking, The Natural Foods Cookbook, A Russian Jew Cooks in Peru, Soul Food Cook Book, The Tassajara Trilogy, Pains Spéciaux & Viennoiseries, Whole Earth Cookbook, The Wok: a chinese cook book, Southern Living Cookbook for Two, Lebanese Cuisine, The Art of Syrian Cookery, Popular Greek Recipes, In a Persian Kitchen, The Art of Pennsylvania Dutch Cooking, and The Southern Living Cookbook Library. A great recipe book for stews, desserts, and butter. The Cooking of Vienna’s Empire last modified April 3rd, 2013.